Santa's Birthday Gift does something I have never seen before. It combines the traditional story of Christmas with Santa. I am sure I am not the only parent to be asked how Santa fits in with Christmas. This book may provide an answer. 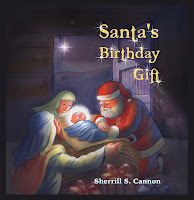 The rhyming tale starts with the birth of Jesus in a Bethlehem stable. At the North Pole, 'an angel named Santa Claus' (who is toy maker) wakes to starlight, packs toys into a sack, hitches his reindeer and offers a prayer. The reindeer fly Santa Claus to the manger in Bethlehem where he offers his gifts and promises to deliver gifts each year in celebration of Christ's birth. Santa's Birthday Gift has won two awards: a Silver Readers Favorite Award and a National Indie Excellence Finalist Award. Australians can buy through any online store and the book is printed and shipped from Melbourne.